I have a huge snacking problem. Chips, crackers, pizza you name it, and I’m probably snacking on it. I’m especially fond of snacks made from refined and processed carbohydrates. These foods were making me gain weight and feel tired. And it’s no wonder, because refined grains (like white bread and crackers made with processed flour) spike the body’s insulin levels. Higher insulin levels can make you feel tired.I decided to eliminate bread products for one month and see if I would lose weight and feel better. You don’t realize how much bread and other wheat products you eat every day until you stop cold turkey. The products I decided to swear off included: grain-based products such as pita chips, cookies, pasta, pizza, croutons and cakes. I don’t need bread to feel satisfied. Eliminating bread products helped me drop pounds and gain energy. After one month, my boyfriend and I each lost significant amounts of weight. However, it’s important to remember that grains provide important vitamins and minerals that you shouldn’t completely eliminate from your diet. The Scientific Report for the 2015 Dietary Guidelines recommends “that a healthy dietary pattern is higher in vegetables, fruits, whole grains, low- or non-fat dairy, seafood, legumes, and nuts; moderate in alcohol (among adults); lower in red and processed meats; and low in sugar-sweetened foods and drinks and refined grains.” The key words here are higher in whole grains and lower in refined grains. Studies also have shown that gluten-free diets that eliminate all foods containing wheat are generally not beneficial to people who do not have Celiac disease or a gluten-intolerance. They may help you lose weight in the short-term, because they’re restricting the types of food available to you, but evidence indicates diets that strictly limit carbohydrates (or emphasize high-protein) may not be effective or safe over the long term. It’s not about the specific foods you eat or don’t eat when you’re trying to lose weight; instead, it’s all about your overall daily intake of calories. 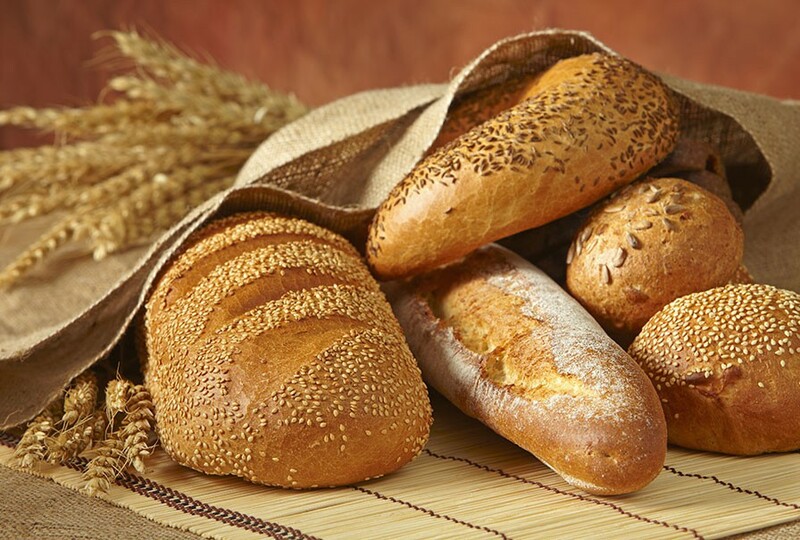 Cutting back on bread products can be part of a strategy to lower your calorie or carb intake for weight loss. However, how quickly you lose after cutting out bread depends on which foods you eat instead of bread. As with any weight-loss plan, consult your doctor or dietitian to help you design a plan that suits your needs. When you’re plan is to cut bread from your diet to lose weight you first need to know the number of calories you’re getting from the bread you eat; calories in bread products vary greatly. For example, a slice of whole-wheat bread has 81 calories, an English muffin has 129 calories, and a large whole-wheat pita has 170 calories. Read the food labels of your preferred bread products to get an idea of the number of calories they contribute to your diet. If you’re cutting out bread to reduce your carbohydrate intake, it’s important to know that carbs are in a variety of different foods, including rice, pasta, potatoes, peas, fruits and milk. But if bread is your primary carb food, cutting back on how much you eat can help you reduce your total carb intake. Weight loss is about changing your calorie equation, meaning the number of calories you take in must be less than the number of calories you burn. To lose 1 pound to 1 1/2 pounds a week, your calorie equation must create a negative balance of 500 calories to 750 calories a day. If you’re eating six to 10 slices of whole-wheat bread a day and cut them all out of your diet, then you stand to lose 1 pound to 1 1/2 pounds a week. If you don’t eat that much bread to begin with, you may not lose much by going bread-free. For example, if you only eat one slice of bread a day and cut that slice from your diet without replacing it with another food or making any other dietary changes, it may take you about six weeks to lose a pound. But if you eat bread with every meal, such as an English muffin with breakfast, a large pita at lunch and a roll with dinner, it can save you nearly 400 calories a day, which, over the course of four weeks, can lead to a 3-pound weight loss. Despite what you may hear, bread can fit into a weight loss plan — if you choose wisely and watch your portions. White bread products tend to digest quickly and cause a rapid rise, then fall, in blood sugar. If you’re trying to lose weight, choose breads with more satiating power and less of an impact on blood sugar, such as 100 percent whole-grain bread. But, like everything you eat, the calories in the whole-grain bread still count toward your daily total.